Slamjet Stadium is pretty chaotic in its Solo mode, in that crazy future bloodsport sort of way. Playing bumper cars with a soccer ball, more or less. Then you add a second player on the same screen, and things get downright aggressive. 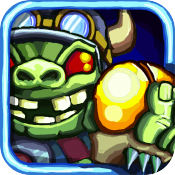 This is a game that encourages players to steal their opponents’ units if it helps. Anything goes, though you really ought to stop before your opponent gets physical. It’s probably not supposed to be that sort of bloodsport. 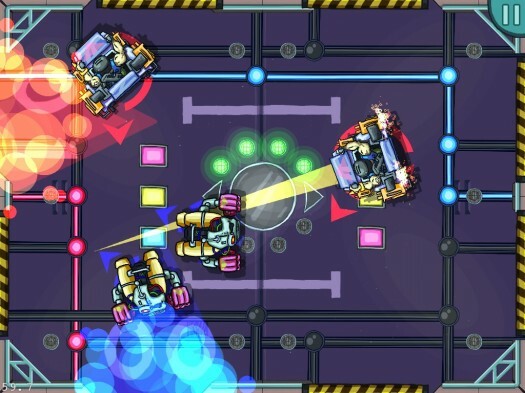 Each player (or team) controls two units, slingshotting them to try to get a small ball into the other team’s goal. The stadiums are claustrophobic. Four bumper car-style units is a crowd, and anything more would be impossible. Half the battle is avoiding your own goal, and the rest is making the best of the arena. In single-player, that doesn’t mean much. The arenas are simple, and opponents don’t do much but shoot to win. There are powerups, clever in their implementation, that go entirely unused. They cycle in the centre of the field, swapping through times and teams. Tap that center at the right moment and you’ll power yourself up. Tap it at the wrong moment and you’ll power up your enemy. They won’t do it for themselves, so you might as well do it for them. As you can probably imagine by now, you shouldn’t play alone—not for long. There is a solo campaign, with three tournaments of increasing difficulty. With an opponent that ranges from barely mobile to occasionally challenging, though, it isn’t really there for much more than the learning curve. You can unlock a few arenas in solo play—arenas for the multiplayer part of the game. Which, in case you haven’t picked up on it, is where you should be spending your effort. There are limiting factors, of course. You can play with two players, or up to four if you’re willing to let things get really messy with two players per team. Either way, they have to be local. There are no multi-device modes, which is a shame. The chaos might suffer some from being played online, but the core of the game is solid without all the hand-bumping. If you have another local player, on the other hand, you’re set for quite a lot of ridiculous fun. You only need to commit to the craziness, and Slamjet Stadium makes that easy. The whole game has this crayola-bright hand drawn look, interface, loading screens, menus and all. The teams are clever caricatures of sci-fi tropes. The audio is full of the sort of over-the-top sound effects and announcement you might find at a sporting event that knows it isn’t meant to be taken seriously. It’s a peppy world to play around in, and an upbeat game to play. Just so long as you don’t take it all that seriously. It might be nice to have a tournament structure for multiplayer, but no. Probably not a good call to get folks too invested in success in a game that encourages stealing other players’ units, cheating, fighting for control of the iPad and otherwise making a nuisance of one’s self. Slamjet Stadium is made to be taken lightly, to be played for a laugh when you’re with good friends. Not the sort of friends that feel strongly about winning or losing, though. It’s all about how you play the game, and we’re not talking about good sportsmanship.